I live in Atascosa county in Pleasanton Texas, I have an abundance of Live Oak and Ash trees shading my property and need a groundcover for my backyard which is nothing but sand and where I have dogs and a major flea problem. Can you please help me find a traffic and animal hardy, shade loving, flea fighting, native that loves sand and can handle 30+ year old oaks? Thanks for your tough question. You have a very challenging site for any type of plant - shade, sand, flea fighting, and foot/paw traffic. 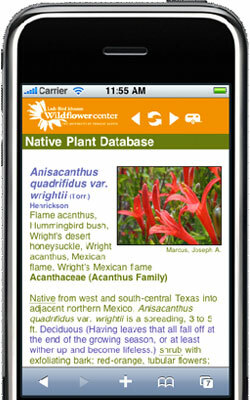 So to start, take a look at the Native Plant Database on our website (www.wildflower.org) and put in the following search criteria: Texas, Herb & Vine, Perennial, Shade, Dry and 0-1 feet to find a native groundcover. Mitchella repens (partridgeberry) A trailing, evergreen herb with white, fragrant, tubular flowers in pairs. Partridgeberry is a creeping, perennial herb, no taller than 2 in. high. All parts are dainty, including its pairs of small, rounded, evergreen leaves; tiny, trumpet-shaped, pinkish-white flowers; and scarlet berries. A most attractive woodland creeper with highly ornamental foliage, it can be used as a groundcover under acid-loving shrubs and in terraria in the winter. The common name implies that the scarlet fruits are relished by partridges, and they are consumed by a variety of birds and mammals. Parthenocissus vitacea (Hiedra creeper) A vine with good fall colour and tolerant of shade and sand. These plants have some ability to withstand foot traffic but not continuously. So it is adviseable to restrict the areas that the dog can trample - at least until the groundcovers are established. There are several articles online about plants that repel fleas. Most of the plants listed are herbs - rosemary, sage, mints, lavender, etc. Perhaps these can be planted in a sunnier part of the garden to help fight the fleas. May 02, 2015 - Can bluebonnet seed pods be gathered when green? Will the seed be capable of germinating next season? February 03, 2008 - Can you give me names of some disease-resistant summer squash varieties available in Central Texas?